If you ask some people - mostly those in the low-power processor market - they'll probably tell you that low-power CPUs based on ARM designs are the future of cloud servers. The biggest argument against this, though, is that current processors have been optimised for exceptionally low power-draw, and even when multiple chips are combined in parallel they don't have the performance to compete with the Xeons and Opterons of the world. Marvell is looking to change that, though, with the announcement of a new processor designed specifically for use in servers. 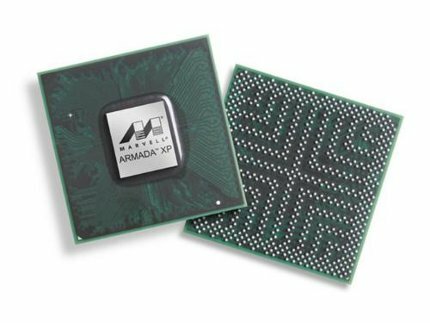 The Armada XP manages to combine four ARM v7 cores clocked at a frequency of 1.6GHz with 2MB L2 cache, leading to performance figures of around 16,600 DMIPS. While this won't trouble the best from Intel or AMD, it manages to hit these numbers with a power-draw below 10W, serving up exceptional performance-per-watt. Combined with the ability to install multiple SoCs into a relatively small space, this will allow server-manufacturers to build pretty formidable systems. The company is also boasting advanced power-management and incredibly low idle power-consumption, which will be huge selling points for anyone running a data centre. Being a SoC, each chip also has PCIe, Ethernet, USB and SATA support built right into the silicon, as well as the ability to run 64-bit ECC DDR3. Marvell didn't disclose when these chips would hit the market, but they're currently sampling to customers. This could mean that servers based on the chips will be shipping within a few months. The announcement marks another step into the server market for the ARM ecosystem and gives further weight to the argument for ultra low-power server CPUs. While Intel has largely dismissed the idea, AMD is reportedly looking into using its next-generation netbook CPUs in a server environment. As time goes on, both companies will no doubt be looking on with great interest.